A loadmaster is an aircrew member on civilian aircraft or military transport aircraft. Loadmasters serve in the Air Force, Marines, Coast Guard and Navy of many nations or many civilian airliners. The loadmaster performs the calculations and plans cargo and passenger placement to keep the aircraft within permissible center of gravity limits throughout the flight. 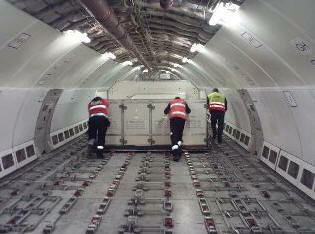 Loadmasters ensure cargo is placed on the aircraft in such a way as to prevent overloading sensitive sections of the airframe and cargo floor. Considerations are also given to civilian and military regulations which may prohibit the placement of one type of cargo in proximity to another. Unusual cargo may require special equipment to be loaded safely aboard the aircraft, limiting where the other cargo may feasibly be placed. Tactically, loadmasters may also directly affect combat readiness as they are also responsible for determining the load order of aircraft so that more tactically important material (e.g. ammunition) is off-loaded and therefore ready to deploy faster than other support items; this may be especially germane to forward operating bases. The loadmaster may physically load the aircraft, but primarily supervises loading crews and procedures. Once positioned aboard the aircraft, the loadmaster ensures it is secured against movement. Chains, straps, and integrated cargo locks are among the most common tools used to secure the cargo. Because cargo may shift during abrupt maneuvers, the loadmaster must determine the appropriate amount and placement of cargo restraint. 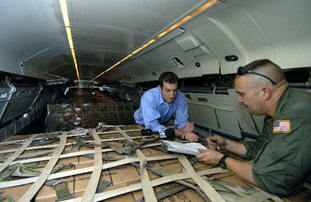 Many loadmasters may also be required to be qualified for "aerial delivery" of paratroops or cargo by parachute. Compared to the relatively routine transportation of cargo, airdrops can be a highly technical and dangerous undertaking. Under some situations, the most effective way to resupply ground troops is by aerial delivery of equipment, ammunition, food, and medical supplies. Many military victories have been dependent in large part upon aerial delivery.